When military families know that their health needs will be met, they feel a sense of protection, of well being. That sense of comfort begins in the northeast corner of Joint Base Lewis-McChord (JBLM) at the Madigan Army Medical Center, where over 100,000 active-duty servicemembers, their families and retirees receive world-class healthcare. This blanket of care began in 1944 as a temporary hospital for war wounded soldiers. Since then, Madigan has grown to become the Army's second largest medical treatment facility and cutting-edge, advanced medical center. It is one of only two designated Level II trauma centers in the Army, and one of four in Washington state. Since the late 1990s, Madigan has participated in a partnership called the Tacoma Trauma Trust with St. Joseph Medical Center and Tacoma General Hospital. This trifecta of medical services providers provides care to non-beneficiary trauma victims outside the gates of JBLM. The Madigan Center maintains about 220 beds for inpatient care and can extend to accommodate more than 300 inpatients during emergencies. 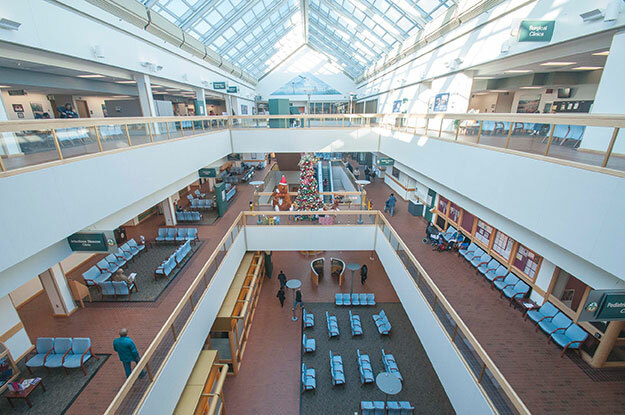 Nearly one million outpatients are seen per year in the hospital's medical mall complex. More than 45 surgeries, nearly 4,000 prescriptions, and eight births occur daily. "When we've got your family members in our house, they are going to be well taken care of," said Col. Thomas Bundt, Madigan's commander. "There is a ‘Madigan spirit' here, a character you have to live; it personifies the people who are committed to our patients." Stopping for a moment, Col. Bundt spoke quietly of the letters written by family members he has received and read talking about the compassion and care a loved one received. "Some of the most moving writing I have ever read," he said. This care is amplified by the center's reputation as an outstanding teaching and modern research facility. The standards to which the Madigan medical staff live up to is evident in the high scores the physicians, nurses and medic students earn after completing various classes in Madigan's Graduate Medical Education programs. "There is the meeting of readiness requirements, the care of the community, and the care of my staff," continued Madigan's leader. "We work very hard to exceed expectations in all areas." Among the many services Madigan offers, three recently added ones come to the fore. School-based health clinics: This past fall, Madigan opened the first Army school-based health clinics at Bethel High School and Middle School, and at River Ridge High School in Lacey. The program has recently been expanded to include military-connected students in the Clover Park, North Thurston, Puyallup and Steilacoom school districts. "The classroom is the waiting room, and this program makes it easier to provide medical care for dependents while also relieving soldiers of having to leave their assignments to take care of a child," explained Bundt. "It's a readiness benefit; it's an intangible that benefits servicemembers and their families." JBLM CARES: Opened in 2017, the JBLM Center for Autism Resources, Education and Services (CARES) is a partnership between Madigan and the JBLM Directorate of Personnel & Family Readiness, which provides care and services for autistic military children and their families. The center also offers occupation, physical and speech therapy, applied behavior analysis (ABA), Exceptional Family Member Program (EFMP) Systems Navigation, CYSS (Child, Youth and School Services) Respite Care. "There are long wait lists," continued Bundt, "and treating children here decreases the wait for services until they can be treated at an off-base community partner." Stop the Bleed Program: With the increasing number of traumatic mass incidents, this new program is a national initiative to teach as many people as possible life-saving first aid skills. Trauma medical staff from Madigan confer with area schools and then provide instruction to staff and faculty members on how to treat trauma injuries. "Collaborative community education is another intangible benefit we provide to the community," said Bundt. In talking about Madigan's legacy, Madigan's commander takes the time to mentor future leaders in military medicine through the use of townhall meetings and seminars. "We have a spirit of service that pervades the organization, of what we can do for our patients and this community," said Bundt. Bundt mentioned at this year's Christmas tree lighting ceremony, an 8-year-old child battling terminal cancer turned on the lights. "There's was not a dry eye in the house, and her turning on the lights is not in the regulations or dictated by any agency," concluded Bundt.